Home Page | Height Increase | Hidden benefits – Heel lifts can make you look taller! Hidden benefits – Heel lifts can make you look taller! Heel lifts are taking the market by storm. This revolutionary new product that originated in the far east is a secret method used by men worldwide to appear taller. Men obviously are not comfortable with wearing high heels as they are associated with women and men are conscious that obvious attempts at trying to appear taller can be taken the wrong way by other men and open themselves up to ridicule. This is where the heel lift steps in, simply place them inside your favorite flat shoe and suddenly as if by magic you are taller. On the outside no one will ever know that you are wearing heel lifts, thus you can gain that extra height advantage without opening yourself up to ridicule by your friends. You can gain up to 3 inches in height just by using heel lifts. Simply stack the layers to achieve your desired height. They can completely transform your appearance and how you are perceived by other men. Ultra soft and incredibly comfortable and easy to clean as well as affordable. Heel lifts are used by models and actors all over the world. There is also emerging evidence that taller men get promoted further and faster at work, heel lifts could end up paying for themselves. Taller men are also desired more by women as they are perceived to be more able to provide. Not only will heel lifts help to make you taller but they have also been proven to help with different foot injuries and problems as well. For example heel lifts are widely used to help correct leg length discrepancies as well as help ease injuries such as Achilles tendinitis and plantar fasciitis. Here at NuovaHealth all of our heel lifts utilize orthotic support technology to help better support your feet and and ease pressure and tension off your heels helping you to walk more comfortably and appear taller! Try them out today, we are absolutely sure you will just love them. They are incredibly fun to wear and you will be surprised with the reactions you get from men and from women. The men will want to be you, the women will want to be with you! Just don’t let anyone know you are wearing them, let this be our little secret. What are the best heel lifts to wear? 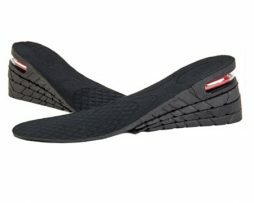 Below we have compile a list of some of the best heel lift insoles that you can wear. These insoles will comfortably support your feet correcting common causes of heel and foot pain whilst also giving you a boost in height. All of our insoles come with a full 30 day money back guarantee which means you have nothing to worry about if you find that the insoles aren’t right for you. 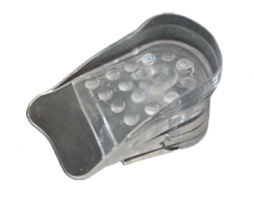 Adjustable, discrete, shock absorbing gel heel lifts. Ideal for height increase, correcting leg length discrepancy and treating injuries such as plantar fasciitis and Achilles tendonitis. 1x pair of gel heel lifts! 1x Pair of Heel Lifts (10 layers in total: 5 for the left foot, 5 for the right foot). Total height gain with all 5 layers = 1.5 inches. Full 30-day money back guarantee. Achieve social, career or dating success… We all know that with increased height comes increased confidence and also increased perceived attractiveness and dominance. We cannot recommend our height increase range enough. With increased confidence and perceived dominance, you can go for the job promotion and ask that special someone on a date. Get paid more and feel more attractive. Completely discreet – no one will ever know you are wearing them. They are designed to be hidden within the shoe. Men, unlike women, don’t want it to be known that they are not really as tall as they appear to be. High heeled boots are too obvious to outsiders, whereas the heel lift exists within the shoe so there is no way anyone will know you are wearing them. Also used for the correction of leg length discrepancy. Leg length discrepancy can lead to unwanted pain and a cosmetic issue. This is instantly corrected by placing a heel lift under the shorter heel. Adjustable layer system – simply add and remove layers to achieve the height you desire. Use all 5 layers to gain 1.5 inches in height. Stack 10 layers together to gain 3 inches in height. Leg length discrepancy is easily corrected due to the precision of stacking the layers. We recommend that if you are going for a much taller height such as 1.5 or 3 inches + then you purchase a pair of shoes 1 size over which you would normally get for the extra room for your foot and also a longer pair of trousers so as to maintain the hidden illusion of height. Super soft and super comfy. The monolithic gel molds to the shape of your foot. No discomfort from hard inflexible insoles the gel makes walking extremely comfy. Excellent for reducing strain on ligaments and joints due to the gels shock absorbing properties. Nuova Health heel lifts fit all shoes and all sizes as they are designed to fit around the heel as opposed to fitting a specific shoe size. Also unisex – men and women can enjoy our heel lifts. You get 1 Pair or 2 high-quality gel heel lifts – one for the left foot and one for the right foot. 5 Layers for each foot, if you use all 5 layers you will gain 1.5 inches in height. Want to make yourself taller? Why wait to grow taller when you can simply wear a pair of these height increasing insoles. You can increase your height by as much 3 and a half inches instantly. Total height gain using 4 layers = 3.5 Inches. Layer stacking system lets you quickly and easily adjust your heel height to the desired height. Super discreet and hidden inside your shoes; means nobody will know you are wearing them! Can be used to help correct leg length discrepancy’s. Air cushion design helps keep your feet protected against shock reducing risk of damage and injury to your feet. Arch support helps to prevent common overuse injuries such as plantar fasciitis by supporting your arch and preventing excessive pressure and strain damaging your feet. Orthotic compression repositions your feet into the optimal position eliminating functional problems and biomechanical imbalances that can result in injury. Heel lift helps to ease strain and tension off the Achilles tendon making these perfect fro treating Achilles tendinitis. Comes with full 30 day money back guarantee. Now presenting a new innovation in our height increasing range of products. Are you annoyed that you can only be tall when wearing shoes? Want to be tall – ALL the time? Simple to use and highly effective, slip these inserts into your sock and walk taller. Secretive design means that nobody will ever know you are wearing them. Get all the usual benefits of height increase ranging from increased confidence to increased attention. Designed to increase height by an extra inch. 30-day money back guarantee which means if you are not happy with your new pair of insoles you can simply send them back within 30 days of receiving them to get a full refund!